Just for fun I asked some of my writer friends to do an old fashioned grade school essay about their summer vacation. Remember those assignments when school started? I thought it would be a great way to learn about some places they had been. Mary's is more of a working vacation but it looks like she had a great time. I just returned from researching the Amish and Old Order Mennonite communities of Kentucky to prepare me to write book three of the series, A Little Bit of Charm. I traipsed all over Barren and Casey Counties in search of horses and buggies and those who prefer a slower pace of life. I stayed at the home of my best friend in Somerset and took along her three grand-daughters to keep me company. They received a priceless education that surpassed anything found in textbooks. And having them with me opened more doors and lowered many people’s defenses. Who could resist three charming little girls? Although I live within an hour of the largest population of Amish in the country, a writer truly needs to visit the area, since there are so many regional differences. For instance, in Waldo County, Maine, the setting of book one, Living in Harmony, the Old Order Amish allow no rumschpringe, no courting buggies, no youth socials (everyone is present for all get-togethers) and no working in the English world. However, their church services are in English, not Deutsch, to encourage “drop-ins” from the local community. These Old Order Amish have an ecumenical outlook on Christianity, similar to New Order Amish (which makes up only ten percent of the population. And they built a meetinghouse to use for church, Sunday School (yes, they have it on “off” Sundays) weddings and fund-raising events, instead of meeting in each other’s homes. 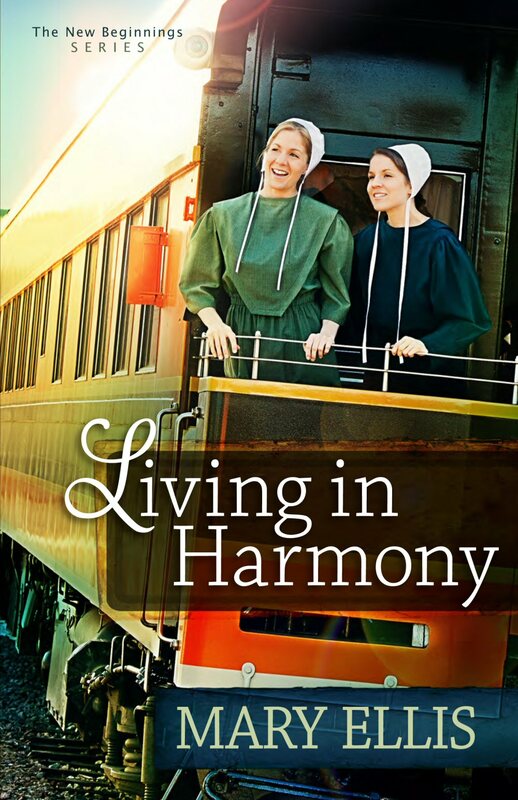 I hope you will look for book one of the New Beginnings series, called Living in Harmony, just released. These photos were taken in Unity, Maine. Mary Ellis grew up near the Amish and fell in love with them. She has now written nine bestselling novels set in their communities. When not writing, she enjoys gardening, bicycling, and swimming. Before "retiring" to write full-time, Mary taught school and worked as a sales rep for Hershey Chocolate. Her debut Christian book, A Widow's Hope, was a finalist for the 2010 ACFW Carols. She has since written eight best-selling novels. Learn more about Mary Ellis at her website and/or connect with her on Facebook. Thanks so much for inviting me to your lovely blog. This is a beautifully set up. You have my compliments! Mary, loved reading this. Opened my eyes to how different the Amish are. Thanks for sharing.